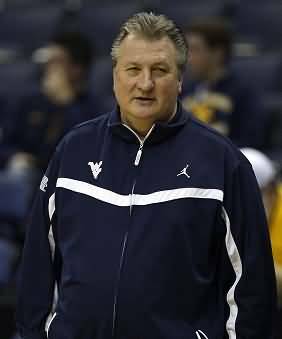 Bob Huggins, West Virginia University Head Coach, is known for having teams that play tough man-to-man pressure defense. However, his trapping style of defensive play will lead to a "numbers disadvantage" on the first pass out of the trap, where the defense is now at a 4-on-3 disadvantage. Coach Huggins uses this drill every practice, as it drills defenders on how to quickly scramble out of the trap and help on the open offensive player. He teaches the man-to-man pressure defense principles of (1) one pass away = deny the pass with the defender on the line, and (2) two passes away = defender is on the helpline. In this drill, we have 4-on-4 but the offense has one additional player O5. 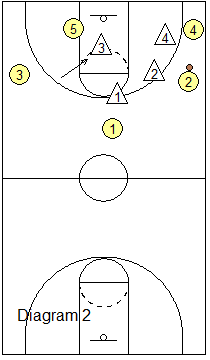 Rule: O5 moves from low block to low block, looking to get the ball and score. Rule: No-one is initially defending O5 (see diagram 1). Rule: O1 is not allowed to make the first pass directly to O5. Before O5 can get the ball, it must first be passed to one other player. 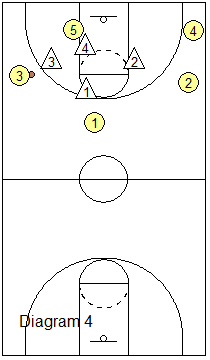 Diagram 1 shows O1 starting beyond half-court, dribbling across and then passing to either wing. Notice that the wing pass is being denied as X2, X3 and X4 are "on the line" defensively. If the pass goes to O2 (diagram 2), X3 must immediately drop down to cover O5. If O2 skip passes to O3 (diagram 3), O1 must scramble to defend O3, while X3 defends the low post O5, and X2 and X4 move to the helpside line. 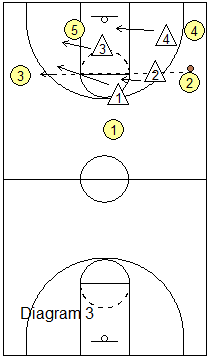 If the initial pass goes from O1 to O3 (diagram 4), then X4 sprints over to cover O5, while X2 drops inside to the helpside line, and X1 is on the line denying the pass back to O1. Defenders should anticipate and defensive rotations must happen quickly. A rotating defender should be on the move when the pass is still in the air. 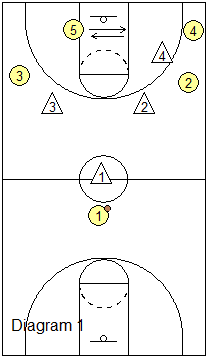 You can make this drill competitive by changing offense and defense every five possessions, keeping score. You can also change the post player O5 for each offensive team. Losers run or do pushups. "Bob Huggins: Full & Half Court Pressure Defense"
with Bob Huggins, West Virginia University Head Coach.